Update: We reached out to RIM and it does look like these will both be full versions. Tetris will be pre-installed and a "lite" version of Need For Speed will be installed with the full version downloading when you have Wifi coverage. I was wondering what games we would see come preloaded on the BlackBerry PlayBook at launch. While I was sort of hoping for a souped up version of BrickBreaker, it looks like RIM is going a different route. They are really trying to put the play in PlayBook... coming preloaded on the BlackBerry PlayBook at launch is going to be EA's Need for Speed Undercover and Tetris. And based on the press release, we're not talking demo versions of the games here, but the full thing (at least that better be the case!). Keep reading for the full press release. RIM will be demoing the games next week in Barcelona at MWC, so we'll soon see the action for realz. Does this make you even more excited to get your PlayBook? Do you think we'll still see BrickBreaker in some form (I sure hope so!). Sound off in the comments! WATERLOO, ONTARIO and REDWOOD CITY, CALIFORNIA--(Marketwire - Feb. 10, 2011) - When users turn on their new BlackBerry(R) Playbook(TM) tablet for the first time, they had better be prepared for some fun and excitement with two iconic games from Electronic Arts preloaded(i) and available for hours of entertaining gameplay - Need for Speed(TM) Undercover, the high-octane action game, and Tetris(R), one of the world's most popular video games of all time. Research In Motion (RIM) (NASDAQ:RIMM)(TSX:RIM) and Electronic Arts Inc. (NASDAQ:ERTS) made the announcement today, ahead of this year's Mobile World Congress, (February 14 to February 17, 2011, in Barcelona, Spain) where the companies will demonstrate Need for Speed Undercover and Tetris running on the highly anticipated BlackBerry PlayBook and showcasing the tablet's next generation high definition 3D capabilities. "The BlackBerry PlayBook is an ideal tablet for gaming with an incredibly intuitive touch interface, high end multimedia features and groundbreaking performance that allows apps to run smoothly and quickly," said Tyler Lessard, Vice President, Global Alliances and Developer Relations at Research In Motion. 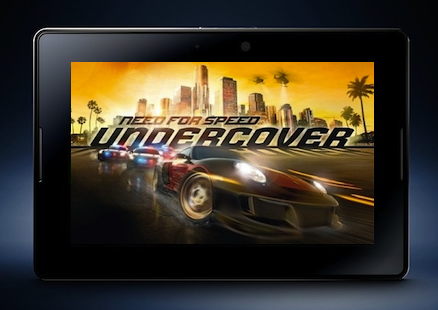 "We are thrilled to work with EA to offer the popular Need for Speed Undercover and Tetris to BlackBerry PlayBook users right out of the box." "BlackBerry PlayBook owners are in for a thrill playing Need for Speed Undercover and Tetris when the new tablet launches," said Travis Boatman, Vice President of Worldwide Studios for EA Mobile. "Bringing these games to the BlackBerry PlayBook is an exciting way for EA to deliver exciting experiences to more consumers on a brand new device. The quality built into EA's games showcases the BlackBerry PlayBook's performance and appeals to a wide audience of consumers." The ultra portable BlackBerry PlayBook looks and feels great, measuring less than half an inch thick and weighing less than a pound. It features a vivid 7-inch high-resolution display that is highly-responsive, with a fluid touch screen experience for apps and content services. The BlackBerry PlayBook is a multitasking powerhouse, powered by a 1 GHz dual-core processor and the new BlackBerry(R) Tablet OS. Known for delivering unparalleled white-knuckle racing, creative customization and street style, the Need for Speed series has generated over $3B in life-to-date sales and has become a powerful pop culture phenomenon. Tetris, licensed to EA by The Tetris Company, is one of the best-selling games of all time with more than 100 million paid mobile downloads. EA has developed the Tetris game on more than 15 different platforms to date. EA Mobile has a solid reputation for its pioneering and market leadership in mobile gaming. For more information about EA Mobile, please visit www.EAMobile.com, join the company on Facebook at www.facebook.com/EAMobile or follow the company on Twitter at http://twitter.com/EAMobile.